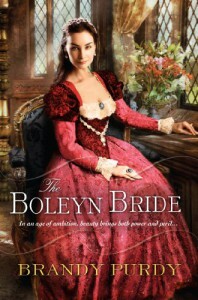 Upon first appearances, one may think that The Boleyn Bride, would perhaps be about Anne Boleyn, the former Queen of England and definitely the most popular of all the Boleyn clan. But this isn't the case. The prologue begins shortly after the murders of Anne and George Boleyn. It is presented from the perspective of their mother, Elizabeth Boleyn. She is furious that her own husband, as well as her brother, were participating judges when the guilty verdict was thrusted upon her son and daughter, resulting in their beheading. Although she is at close proximity to death's door and barely has any energy to speak of, she sets out to her beautiful garden, where King Henry VIII once courted Anne. She wails (practically screaming) and sobs like a "madwoman" while uprooting every single living plant that was taking up residence there. This display of intense emotion is unusual for her, grieving or not, as she has always wore the facade of the dutiful Christian wife. She absolutely does not want any of its beauty exposed or living, for that matter, while her daughter is deceased. "Every time I looked at that garden, I could see King Henry pursuing Anne like a relentless hunter stalking a deer, a fleet-footed doe with terror in her dark brown eyes..."
She also gives the reader a peak inside her torturous marriage to Thomas Boleyn (actually it was Bullen, the last name was changed for pretentious reasons). Thomas' loyalty was not to his family, but only for King Henry VIII, as his trusting and reliable courtier. It appears that Thomas manipulates every relationship he has in order to receive the good graces of the King. Thomas and Elizabeth Boleyn are outright enemies. To say that their marriage is a sham is undoubtedly an understatement. Their unfortunate marriage was an arrangement made by Thomas himself, her father, and her brother. As time passed, neither one of them felt a speck of affinity toward the other and it seemed that appearances were all that mattered to them both, his as having the beautiful wife and healthy children and hers being her beauty. "I kept my end of the bargain and played my role to perfection; only once did Thomas ever have cause to complain of me...when I failed to become the King's mistress." I found it unique to read a novel that is presented as a memoir of someone so fully conscious of their narcissism and arrogance. Normally if I don't like the main character, I would chuck the book without finishing it. Impressively, Elizabeth is presented in such a way that you sometimes overlook her terrible attributes: she's a horribly indifferent and absent mother, she is a bit too promiscuous (let's face it, she's a nymphomaniac at times), and she is so sure of herself and thinks herself to be incredibly beautiful and bewitching. Even with this horrible outlook, there is still something that pulls you in and makes you want to like her. I found myself pulling for her at times and hoping that she would change her perspective, but then she would always let me down (insert 'meh' face). I still held on curiously anticipating what took her from being a detached mother dearest, to pulling weeds out at the beginning of the book while grieving for her children, one of whom she thought of murdering when they were just a wee one. Although the book opens with the setup for the ending, the first chapter introduces a 16-year-old Elizabeth at the height of her pride and arrogance. She was incredibly abusive to her childhood caretaker, Matilda. It seemed that poor Matilda never lived a peaceful day when in the presence of Elizabeth Boleyn. "When Matilda tried to stop me, I turned on her, snarling like a savage beast, wielding the book I held like a weapon. I smashed her nose in with 'The English Housewife' and watched as she fell back with blood spurting from her red and flattened nose. I had broken it, but I didn't care; at that moment I had more important things on my mind." She didn't spare her abuse only for the helpers. Her very own child, Anne, probably got an equal dose, at least of the mental abuse. And this is the one she was crying over after she was beheaded. "Anne was the ugliest baby I had ever seen in my life. Shuddering, I thrust her from me in revulsion, slapping at the hideous wailing thing and the hands that tried to foist her onto me. "Take that hideous thing away!" I screamed. She was as ugly as my mother-in-law's monkey! I would not hold her; the thought of cradling her against my breast made me want to vomit." I have such a hard time grasping the fact that someone would have so much disgust for their own child based mostly on her looks. As stated earlier, she went so far as wanting her dead. "Once when Anne lay crying in her cradle and I sat beside her, contemplating her ugliness, it occurred to me that it really would be better, for all our sakes, if she were to die, as so many children did, in infancy. I just could not believe that something so ugly could have come out of someone so beautiful. I was embarrassed to have her near me and left her to the nursemaids' care whenever possible, to spare myself the pain of having others see the monstrosity I have given birth to and compare her with my other two beautiful children. I was ashamed to be Anne's mother." With such an intense personality, it seems natural that she would fall in love with a commoner, who's personality was even keeled and somewhat shy. They would carry on a secret rendezvous that lasted a lifetime. I honestly feel, based on this novel, that it was her long time lover, Remi Jouet, that cools a little of the fire that burns inside of her (thank goodness!). It's interesting to see the transformation of Elizabeth's personality along the course of her lifespan. Although she seems to always try just about any remedy to hold on to her youth and beauty, she eventually begins to accept that she will lose them both in due time. As she ages, she begins to release some of her arrogance and eventually realizes what a huge part her neglectfulness played in all of her children's lives. Unfortunately, it is her unwavering pride that won't allow her to reach out to her only surviving child, for she is too afraid of the rejection that could result in doing so. It is a relief to experience her slow change of acceptance as an unsupportive mother, but the feeling is spoiled when she ultimately lets pride hold her back from a possible relationship with Mary Boleyn. It makes me wonder if given the chance to do over with "her ugly duckling", would she actually become a better mother? I have a feeling that the answer would be 'no'. In the end, although I was opposed to the idiosyncrasies portrayed by Elizabeth Boleyn, I had a strange affinity toward her. I will say that I am always impressed when a book can take a character with unlikeable traits and allow you to stay involved in the book in hopes that they overcome these terrible behaviors. My only vice with this novel would be the repetitiveness of certain words and phrases. I don't know if it is just me, but I spot them easily and once they have been used more than three times (about the same thing), then it is just purely annoying. Other than that, I say this is an engaging read.